Online Practices for IIT-JEE Main, HSC theory exam More than 18000 Questions on Physics, Chemistry & Mathematics. CEngineers create the world." And if you want to be a part of this creativity you have to be an engineer. 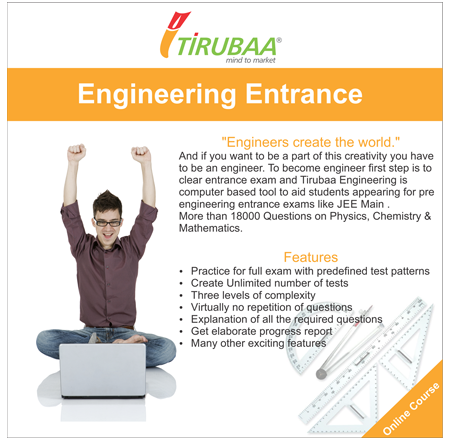 To become engineer first step is to clear entrance exam and Tirubaa Engineering is computer based tool to aid students appearing for pre engineering entrance exams like JEE Main . More than 18000 Questions on Physics, Chemistry & Mathematics. Online Practices for Medical Entrance Exams like MH-CET, AIMPT. 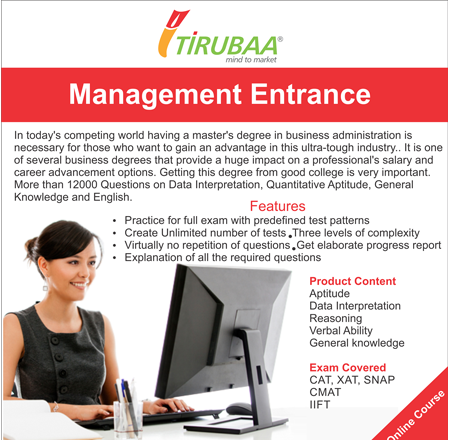 Online Practices for CAT, MH-CET, SNAP & other management exams. More than 12000 Questions on Data Interpretation, Quantitative Aptitude, General Knowledge and English.